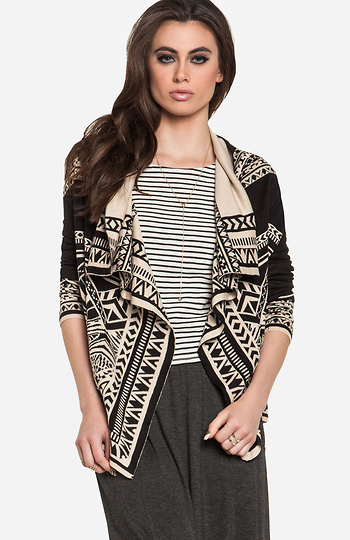 Medium-weight cardigan featuring a scenic tribal print, long sleeves, and a draped open design. Love this tribal print sweater. I was searching for a cardigan-like sweater for a while now, but the design and qaulity of them just didnèt cut if for me. Just feeling the fabric and quality of this sweater shows itès a cut above the rest; and the angular draping of the lapels flatter any body type.